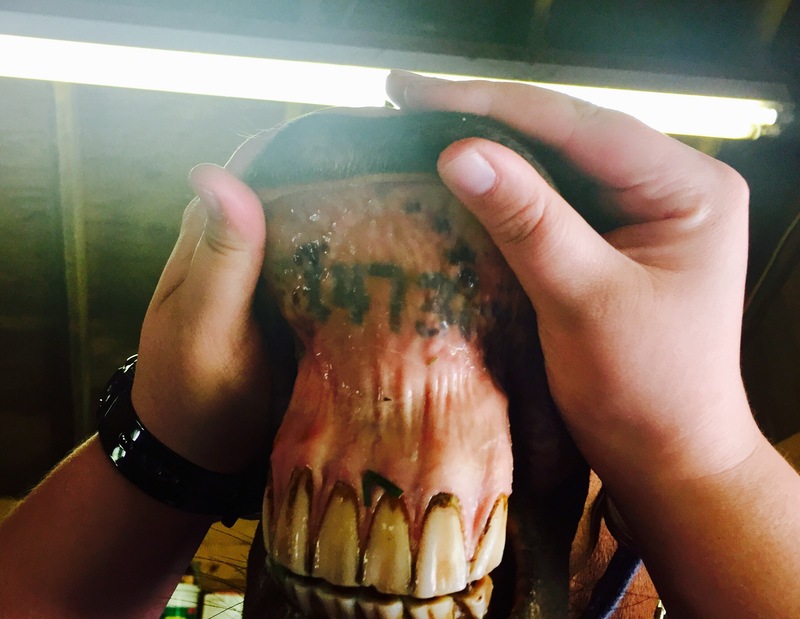 Last Friday I walked in to the barn to find something that no horse owner ever wants, a lame horse. Gen was head bobbing lame, barely able to put any weight on his left front leg, his bad leg. I was near tears when I looked down and saw his tendon swollen up, convinced that he bowed his tendon again. 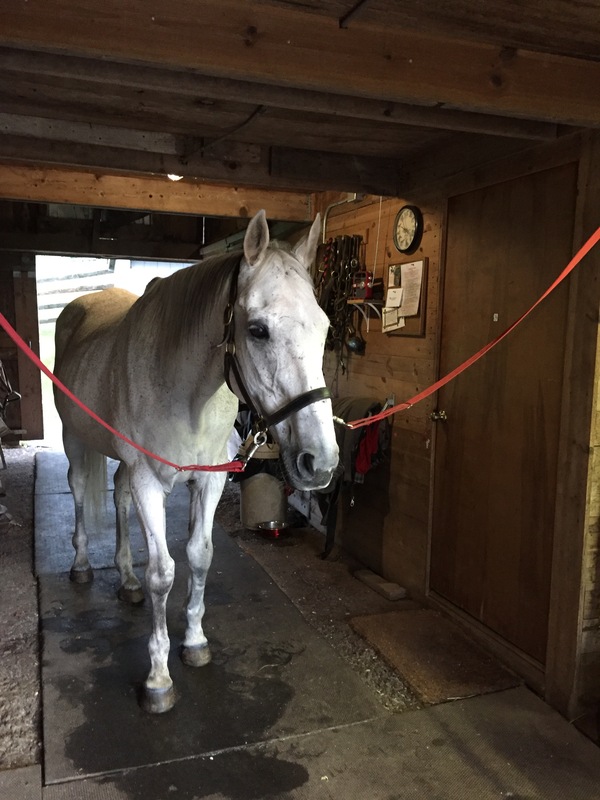 I called my vet, who could hear the strain in my voice, and agreed to hang around the barn until he had finished up with his other appointments for the day. 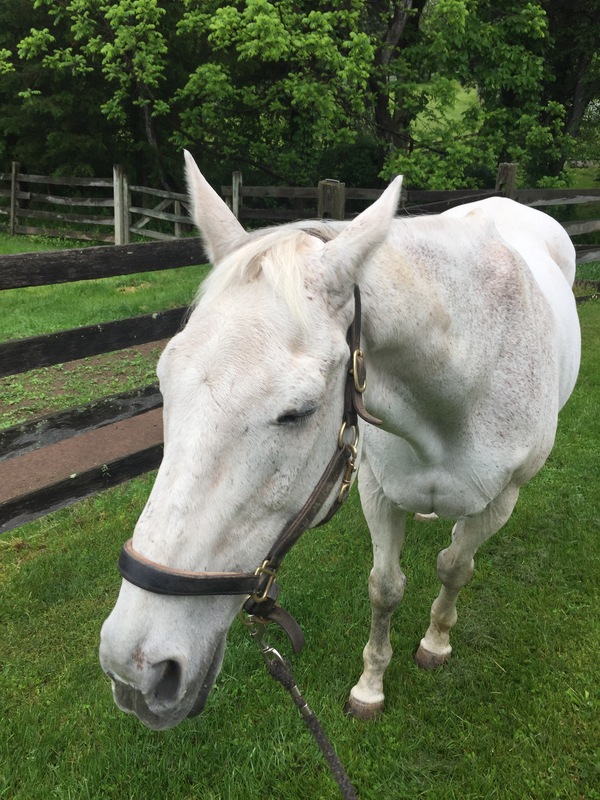 Gen has been retired for a decade and I am really grateful to have had so much extra time with him. I was upset about him having potentially injured himself again, but in the few hours it took for the vet to get there I had already decided that if it was a bowed tendon I at least owed Gen the chance for him to try and heal himself. I had vowed that no matter what the news was from the vet, I would give Gen a month to get better as long as he stayed at the same level of lameness and did not get worse. Adding extra stress to all this is the fact that it is nearly time for my trip to Alaska, so I would potentially be leaving Gen for a week during his time of need. My husband could clearly sense the stress in my texts and decided to come to the barn after work to check on “his son” in person. I am just never okay when Gen isn’t okay, something that everyone who knows me can tell you! I know it looks terrible, that is why I was freaking out! As soon as the vet got there and saw me walk Gen out, he went back to his car and brought back a ton of hoof equipment. I pointed to the leg, wanting to know where the ultra sound machine was, convinced it was the worst case scenario, when my vet quietly bent down, touched Gen’s foot and I watched Gen nearly sit down he was in so much pain. For the first time all day I felt like I could breath again! My hubby was laughing at my panicky self for overreacting, and I was laughing with him! It was a hoof issue! 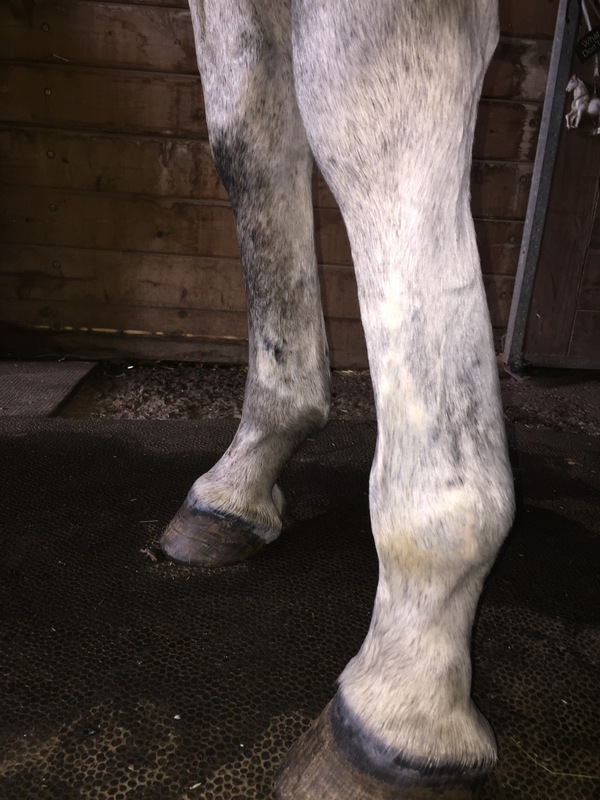 After some poking and prodding (where Gen actually reared up on his hind end enough that both my feet came off the ground) it was clear the pain was in the heel, but other then the fact that his heel was soft we didn’t have a ton to go on. 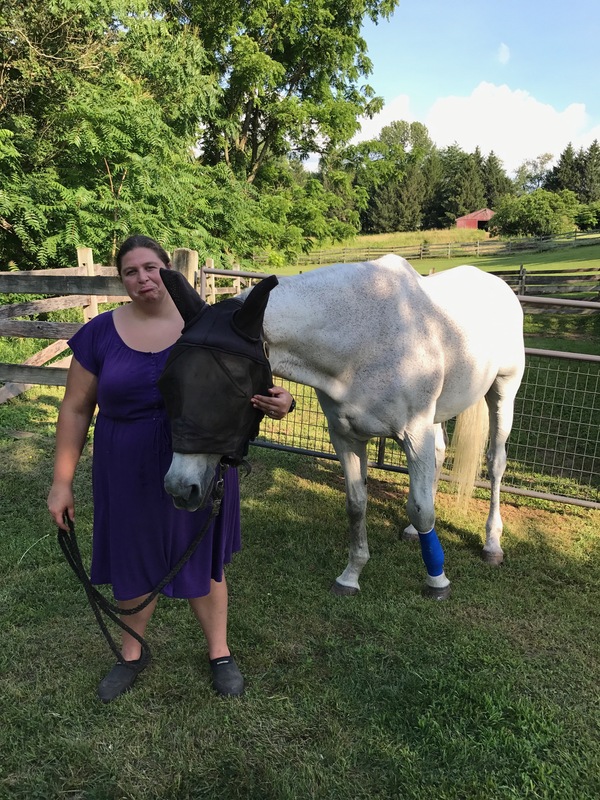 My vet cut off Gen’s hoofwear (a cool almost cast like thing he gets to help save his toes when he incessantly stomps at bugs) and started treating his foot like it was an infection. Already Gen was walking a little better so the advice was to treat it like he had a foot infection and turn him out for a few hours in the hopes of getting the swelling down in his leg. ​Gen enjoying a roll Saturday night, listen to those groans of joy! I was happy over night, slept like a baby, but that all came crashing down when I got to the barn on Saturday morning, Gen was now lame on both fronts. The vet came out again, looked at his now tree trunk sized leg, and poked around again. He felt the same way about his leg as he had the day before, that it was not causing Gen pain, but that his feet were hurting. He told me to treat both front feet now for a possible infection. I got to work soaking, drying, medicating, etc and did that twice on Saturday, staying all morning and coming back before bed. Gen had gotten an injection of pain meds and seemed to be feeling better so I was feeling better about things and watched him at night peacefully grazing after I turned him out. Yes, he was hurting, but maybe moving around a little would make him stock up less and help him feel better. Not as swollen as his injury a decade ago, but not good! 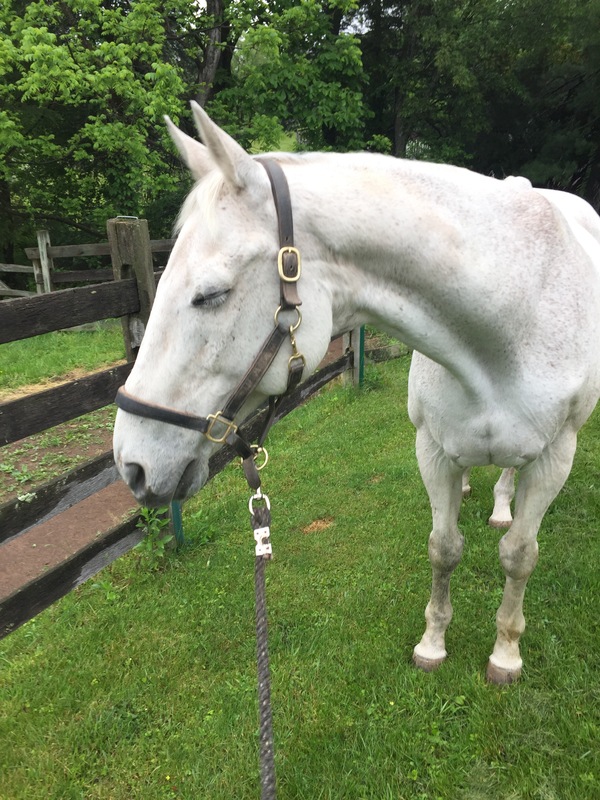 When I got there bright and early on Sunday morning, Gen was dead lame again, leg still the size of a tree trunk, and he was barely moving in his field, pointing his bad foot as he refused to put weight on it. I did cry at that moment, convinced that it had been his leg all along and that I had done terrible damage by not treating the tendon injury from the get go, I know my horse better then the vet. 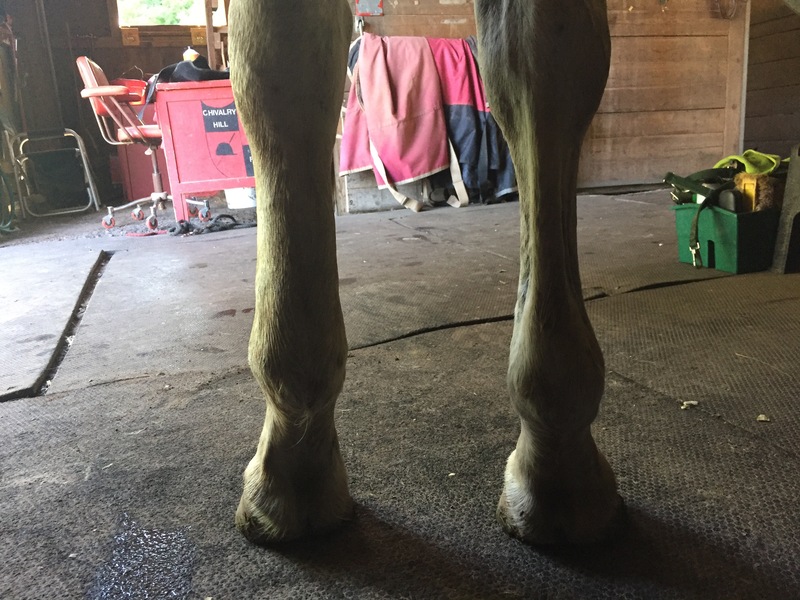 I snapped a picture of how terrible his leg looked and texted it to the vet, along with letting him know that my horse was barely putting weight on his leg and was head bobbing badly when I walked him. 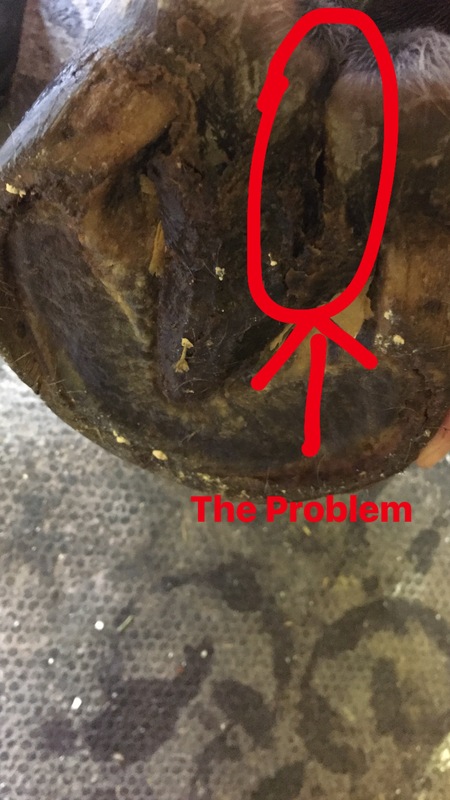 My vet is a very patient guy and instead of grumping at me for bothering him, he told me to go ahead and treat the tendon as though it were injured, but not to stop treating the feet at this point either. 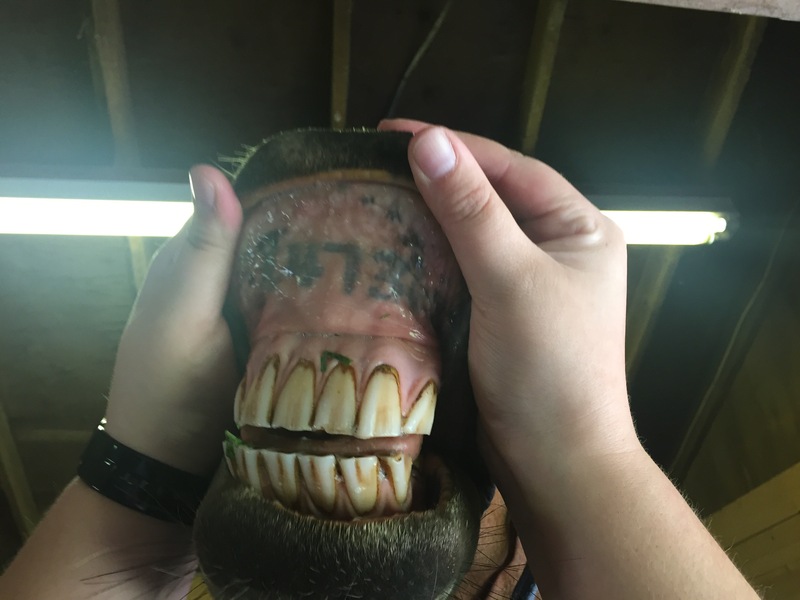 We figured we would give him another day of clearing up his hoof infection in the hopes that would help before he came back out. I spent the morning soaking and treating each hoof in addition to carefully cold hosing, wrapping and taking care of his bad leg. Gen was officially put on stall rest, and I could tell right away he was feeling pretty crappy because normally he makes a fuss being put in pony jail, but Sunday he was almost enjoying to be stuck inside. When I got there Monday morning and he was just as bad as the day before, I knew I needed the vet out again. I had to work so I was at the barn by 5:45 am, and waited to call until 8:00 when I got to work. He said he would be there in a few hours and I spent the day worrying. Such a hard life having a human stare at you for 5 hours a day! When I got the call from the vet in the afternoon I was shaking, afraid of the news, especially when he said that he decided to ultrasound Gen after the nerve block left him with more questions then answers. When he told me Gen’s tendon looked like swiss cheese, I let out a huge breath I didn’t even realize I was holding. While a tendon filled with holes might not sound like a good thing, that is perfectly normal for my Gen! The vet laughed at my relief and admitted he had been a little nervous himself, but had been thrilled with what he saw, which is as healthy a leg as Gen can have. So while it is great news that he didn’t suffer another tendon injury, it still means that Gen is my special boy. If it was a hoof issue, the nerve block should have stopped his limping. If it was a tendon issue, there should be a noticeable area where it was pulled, or even a hole where Gen’s body made the tendon disappear in an ultrasound. 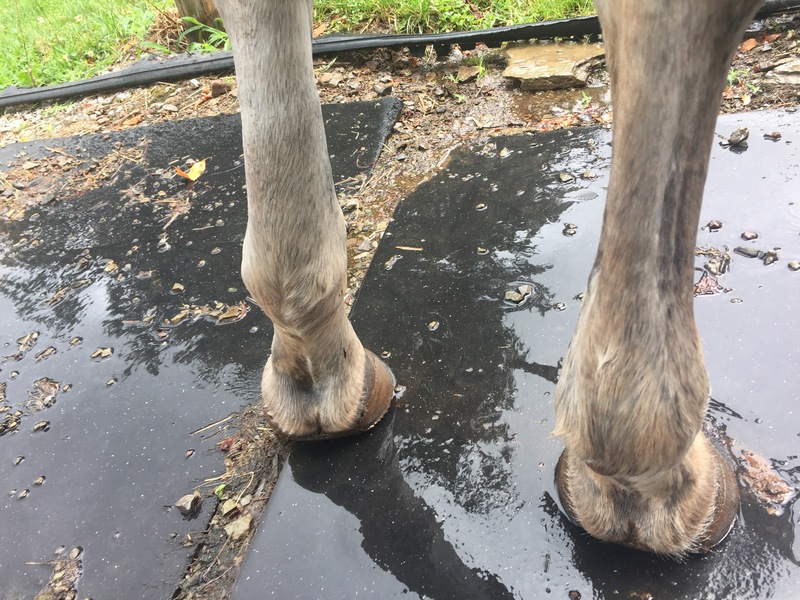 As of today, Gen is letting me touch his heel and all over his hoof without protesting, but he is still very, very lame and reluctant to put weight on his left front. He is slightly better this morning, walking further for a good patch of grass today compared to yesterday where he barely made it out of the barn. Gen as of Monday evening and his level of lameness. 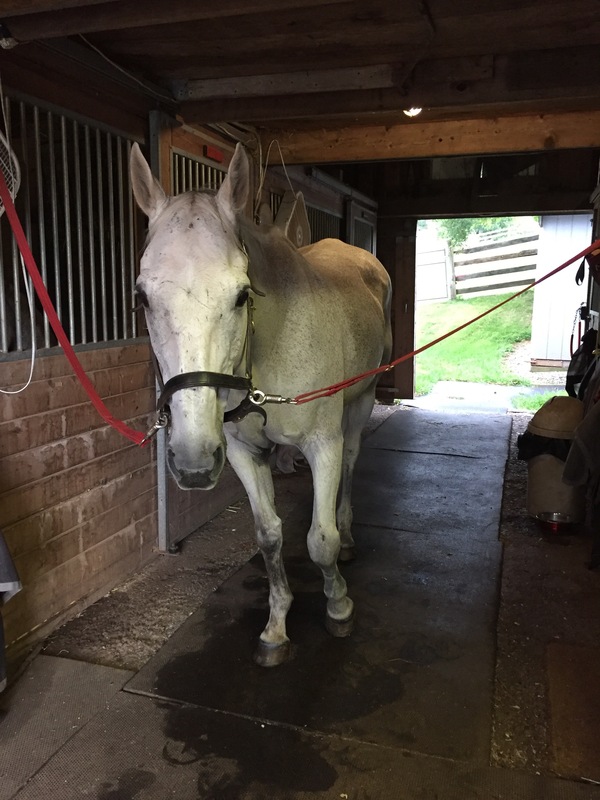 Since we aren’t sure what it is, I am going to keep treating for the hoof, keeping his heel dry and infection free, and keep treating the tendon, taking off the cool cast he got on yesterday and doing the standard cold hose, poultice and wrapping routine. He will be on stall rest with 2 times a day hand grazing for either 20 min, or for as long as he can be quiet for, whichever one is longer and he is getting bute now as well. This could be one of those things that we will just never really know what happened. As long as he gets better I am happy. 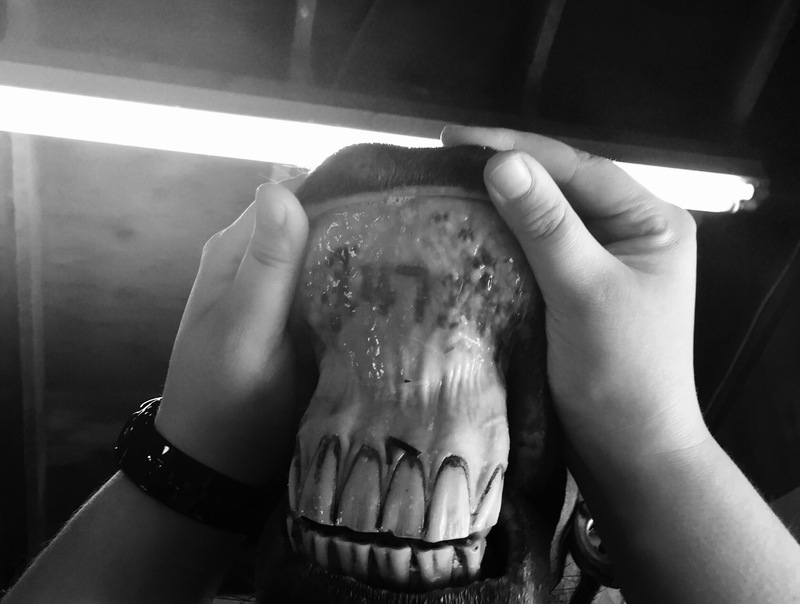 I love my Gen so much, he is me if I were a horse! I will keep you all posted on his progress, hopefully with less wordy posts then this one! I know this is just me being crazy, so if you are still reading this post I have to tell you something that makes me sound like a but job. The day before Gen got hurt I told him that I was leaving soon for a cruise and that I needed him to be a good boy because I was going to be away for a whole week and he wasn’t going to have a “nanny” to come and give him extra love, he was going to have to be a big boy. 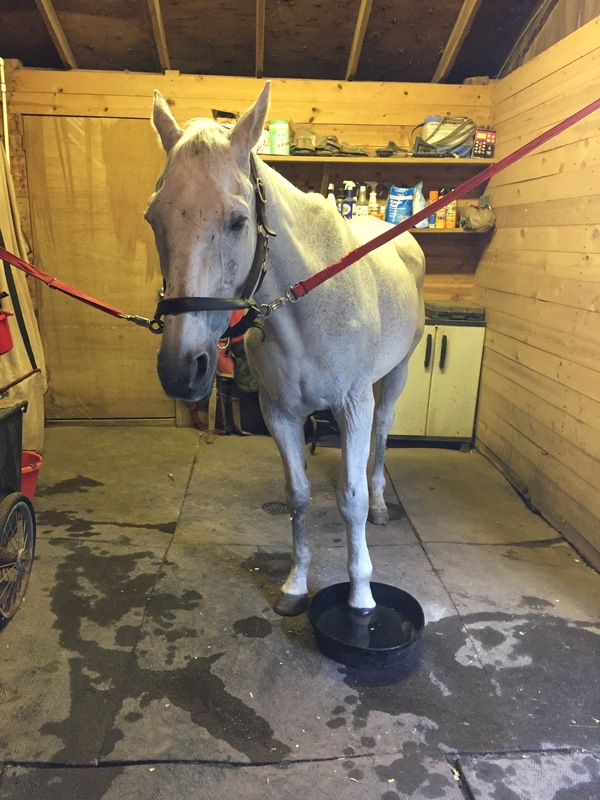 I swear he speaks English and was like, “I am no peasant horse who just gets normal board care, I refuse this arrangement and will now do something to garner daily attention so I can be dotted on when you are away”. My Mexican General really is one of a kind! I am just hoping his spoiled self is all healed up soon so I can worry a little bit less about my pony! Happy 25th Birthday Mexican Gennyral! My sweet Gen is 25 years old today!! To celebrate, I am going to the barn after work and stuffing his face full of treats and giving him a day full of scratchies with no brush in sight. That is right, Gen only gets 2 days a year that I can guarantee not to brush him…both his birthdays! Sigh, even when he is being cheeky he is still a handsome guy! I have been not great about blogging even though I have plenty to write about, so I am going to try and get in the habit again. I am setting myself a very realistic goal of doing something every single week. I used to write every day, how hard can it be to write or take a picture of something once a week? So in honor of my renewed enthusiasm, I am doing a meme and I am inviting anyone to join in and do it as well if they like! 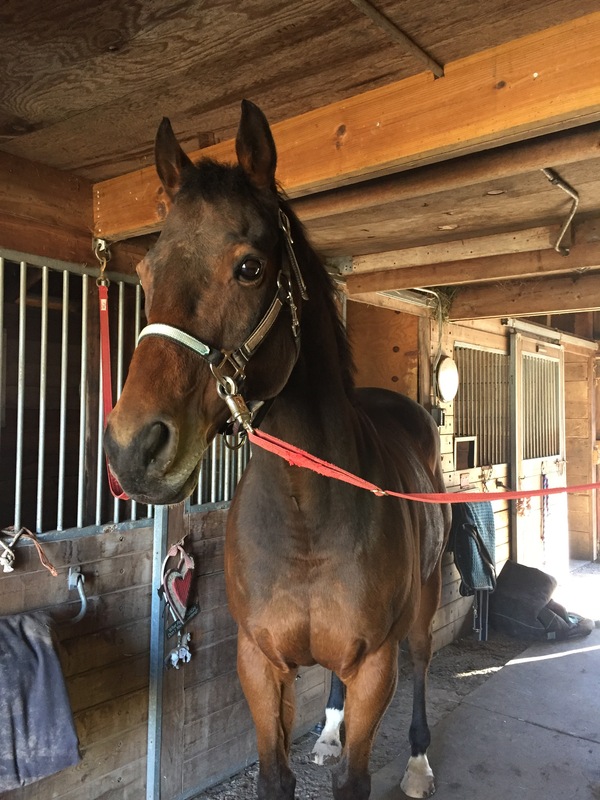 This one comes Clover Ledge Farm (formerly Standardbred Excellence), who I just about panicked when I thought she deleted her blog last week. Turns out it was just moved to http://cloverledgefarm.blogspot.com/ and she is still blogging! I have two and both are very selfish things that I have no control over. So basically, these are not good goals, but they are my goals so here goes. One is that I want Gen to be alive and healthy at the end of the summer. He hates summer, HATES IT! 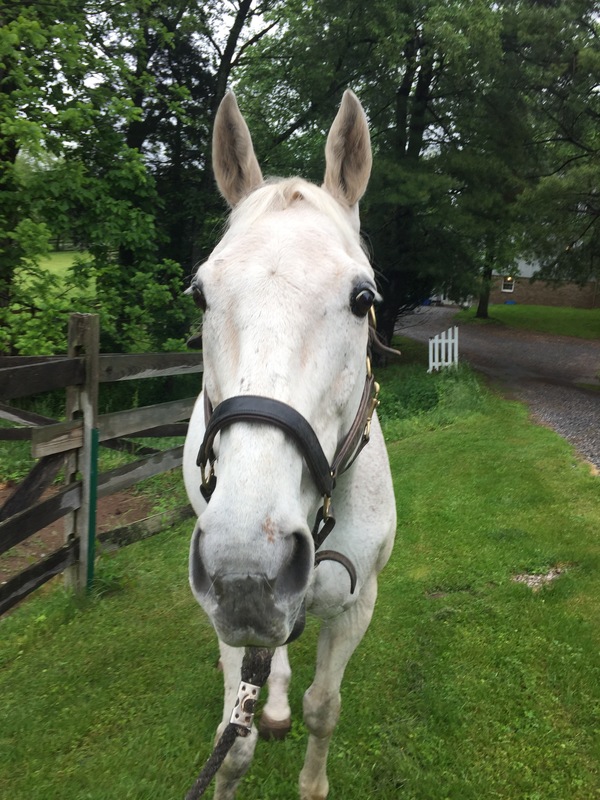 He is just not a hot weather horse, so I always worry about him extra during the summer months. Pretty much my goal every month is to keep Gen healthy and alive and has been for 10 years. He is still with us though so I am happy to keep that as a goal for as long as I can. My second goal is equally out of my control, and that is that I want to be riding D at the end of the summer. I have no control over what D’s mother does, but I am hoping I can wish and pray my way to a full summer of riding! It isn’t even just riding in general I want, I really am enjoying him, he is a cool horse to ride. I know it may not work out, but fingers crossed I can ride D long past Labor Day! Yes, and no. Compared to most barns, the bugs where Gen lives are not bad at all. 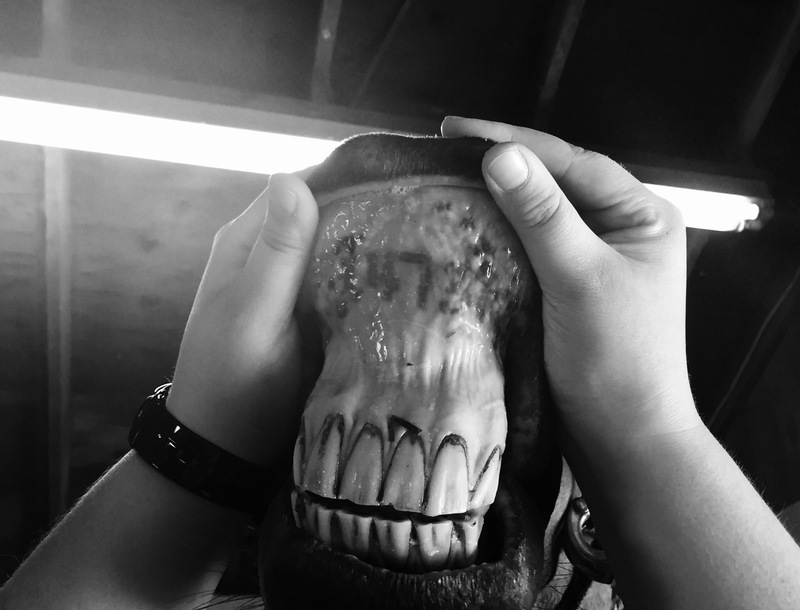 We get comments about that all the time from Farriers, Vets, Equine Podiatrist, etc. So my tip is to find a barn that has good pest management (frequent manure removal, fly predators, good air flow, minimal standing water, etc). That being said, my Gen is a very sensitive boy and thinks that the bugs are terrible. He does have a fly mask and I swear by Endure brand fly spray. It is very, very chemical, but Gen is now 25 with a bum leg and he already has melanomas so if it keeps the bugs away I can deal with the other consequences. Overall I think bugs are just something that all horses and horse people have to deal with! 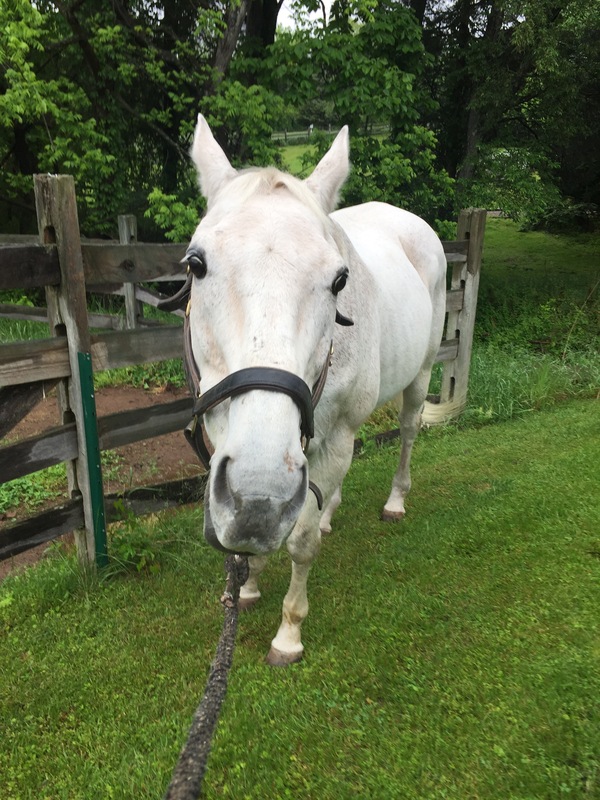 In the summer, Gen gets hosed off just about every day, or at least every day it is over 80 degrees. 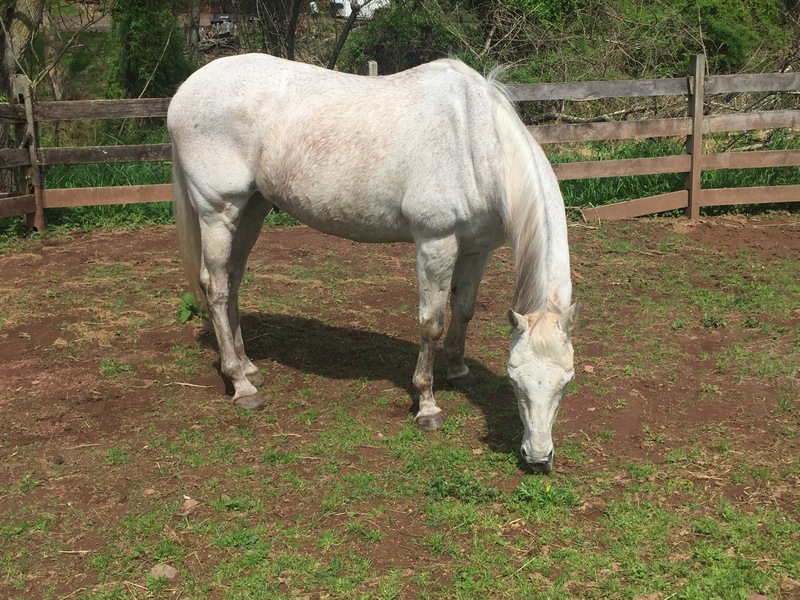 I hate doing it because it dries out his coat, but he just gets so hot that a rinse and some hand grazing in the shade with a breeze is critical to his happiness. I also run a soft brush over him after he is dry every day to get those oils going. Now that he is retired, he probably only gets 10 full blown baths a year, most of which are for his calendar pictures. 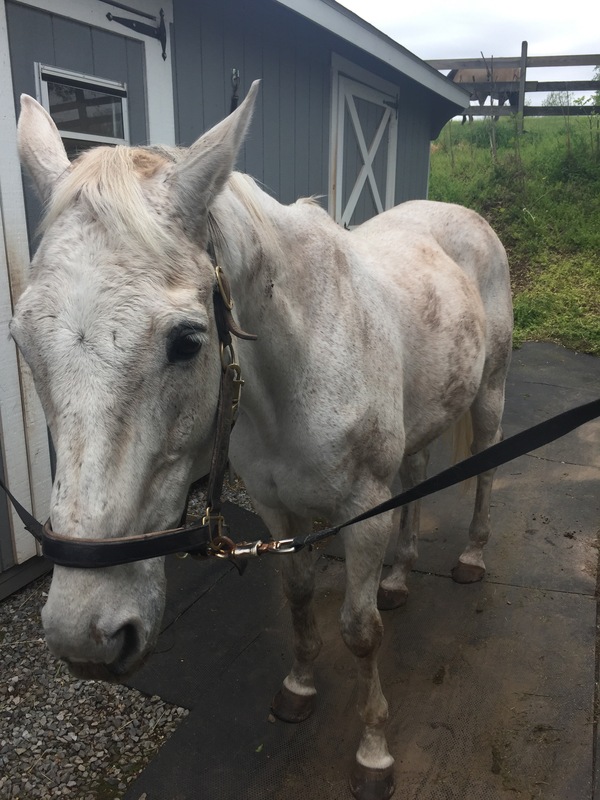 When he was showing I would give him a bath about once a week to try and get him glowing white before each event. Doesn’t he look thrilled about getting a bath?? No fun equine travel plans, but I do have some amazing trips coming up! I am going to Niagara Falls this summer, a place I went to once ten years ago for like an hour and kept saying I would go back. My hubby and I are spending a few days there thanks to some well-planned gift card usage and a free hotel room that is going to expire soon. I am looking forward to just getting away for a few days and just exploring something new. My hubby and I are also going to be taking a cruise to Alaska this summer, which is literally a dream come true! I have been dreaming of going for so long and thanks to amazing people and generous gifts I am finally going to see a glacier!! I cannot even tell you how excited I am to be going! The only “scary” thing is that I will be out of contact and away from my Gen for 8 days, one of the reasons I have never gotten in to cruising! I remind myself that I board my horse for a reason, so I can go on Alaskan cruises and not have to worry! You cannot look a gift horse in the mouth though so Alaska here I come! I have a neighborhood community pool. I literally go just about every day in the summer. Now that I am riding, I will get home some days after it closes, but I am sure I will still go on the days I am not able to ride. Nothing beats the heat like a nice pool! When it comes to horses, I get about as wet as Gen does when I hose him off which also helps to beat the heat. Nope, nor did I do anything to present his Melanomas, which is something I still feel guilty about. Gen hates fly sheets though and is very picky about smells so I am not sure if I could have done anything, but saying I did nothing still feels crappy. I live in an area with very bad air pollution (literally in between two large cities), so when a heat advisory is up, I do not usually ride. If it is going to be several days of a heat advisory, I will make it a point to ride, but to do so early when the sun is rising or late just as it is about to set. I am not a hot weather person, I would much rather ride when it is 25 degrees versus when it is 95 degrees. I am not the best about sun protection. I do use my sunscreen, but I love to ride in tank tops. I have heard about sun shirts and think they would be cool to try, but I am admittedly not too great at covering up in the sun because I get so hot. Just for perspective, my air conditioning bill in the summer far exceeds my heating bill in the winter. No, I never have gone swimming with Gen. 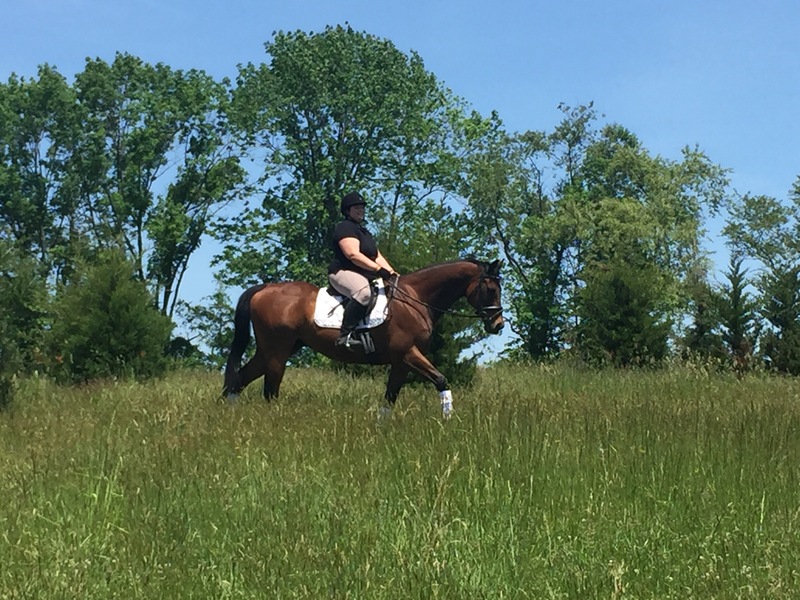 I have had the pleasure of doing it with other horses though and it is super fun! Yet another thing Gen and I will never get to do. I used to lease a horse Skya who would go swimming in a pond in her field every single day in the summer. She would come in soaking wet, but very happy. Well, I am pretty practical by nature so on my wish list right now is a gallon of Endure fly spray and a pair of full seat summer riding tights. I will likely just get the fly spray, but it can’t hurt to look at new riding tights right? It feels a little like I may jinx it if I buy any riding gear for myself. I am also always on the hunt for fly masks. Gen has a hard time with finding comfortable fly masks so I always buy him a new one (or four) a year to see if there is anything out there that works that he likes. I am always open for suggestions if anyone knows any! So remember my last post when I was done with riding and so I was selling everything off? Just as I decided I needed to stop pretending I was an equestrian, a ride has fallen in to my lap. I am riding again! Like regularly riding! I literally cleaned my spare tack and was organizing what to sell and what to keep when an unassuming conversation turned into the best thing ever! I board Gen at a small backyard farm. There are only 6 stalls and 2 are occupied by the owner’s horses. At the moment, it is just myself and another boarder who has been there for years herself. I hardly ever see the boarder unless I swing by the barn on the weekends in the afternoon. A few months ago, on a weekend afternoon, I saw the other boarder getting ready for a winter trail ride. Her horse was very up, and I joked with her about how much braver she was than me. She laughed and did say it had been a while since he was ridden, so I asked her if she ever came up on the week to do anything with him. She said no, and then went on her way. I finished up with Gen and didn’t give our conversation a second thought. A few days later I got a text that she needed to talk to me. It was during a busy day at work so I asked if it was an emergency, thinking she was at the barn and something was wrong with Gen (because why else would another horse person from the barn call :P) She said to just call when I had time. I spent much of the rest of day trying to figure out what she needed to talk to me about. Imagine my surprise when I called her up and she asked if I wanted to ride her horse!!! Of course I answered yes! She said my question about riding during the week had her thinking. 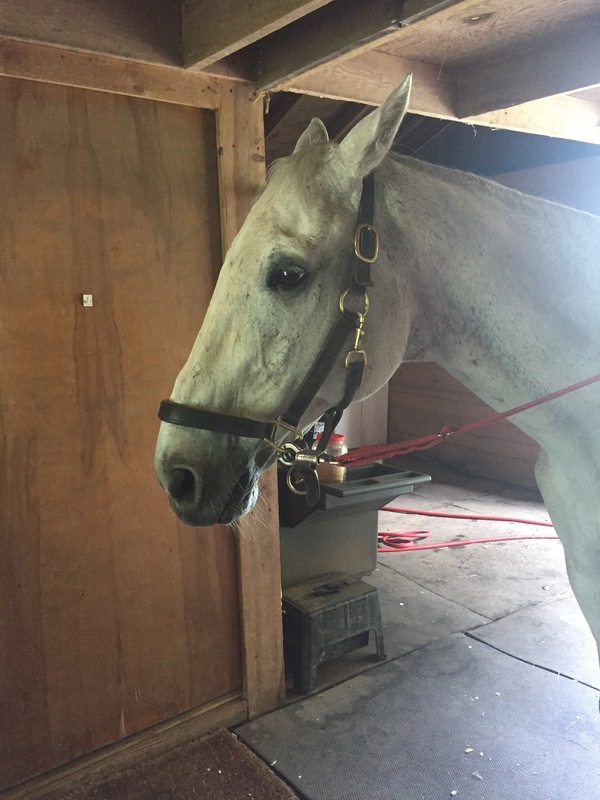 The more she was thinking about it, the more she realized that she just didn’t have time right now to ride during the week, but that her horse is the kind of horse that needs to be ridden regularly. She and her husband talked it over and agreed that they wanted to see if I wanted to ride him during the week! I was (and still am) beyond excited about this. It is not a forever thing, but it is perfect for right now. 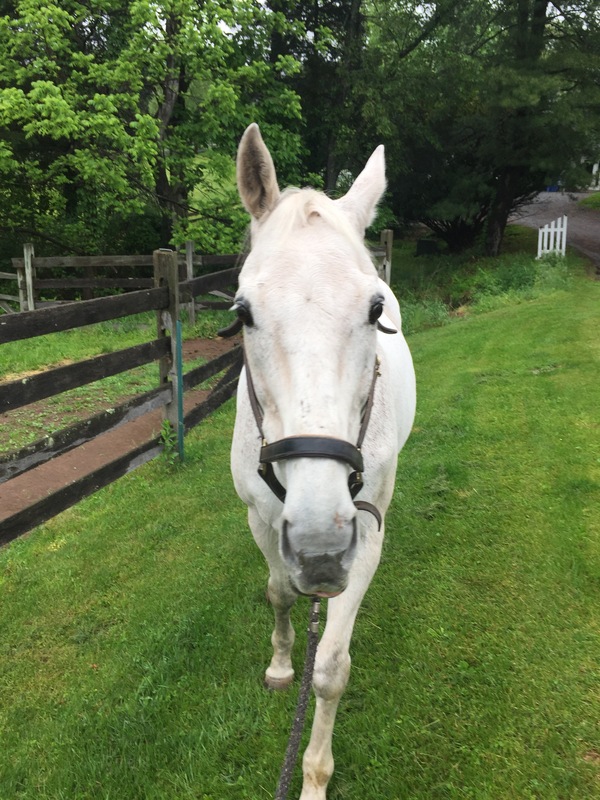 Her life is very busy at the moment, but she doesn’t want to make any decision such as leasing, half-leasing or even selling her horse if her schedule being so full is just a temporary thing. That means that I get to stay on budget AND still ride! She never comes up during the week, so I get to ride whenever works best for my schedule! And I cannot beat the cost…she is just letting me rider her horse! She knows it is tough to pay for one horse already so she is okay with just letting me ride. I literally am tearing up at her kindness as I write this. She is just a really nice (and practical person) and pointed out that this is something that works for both of us. 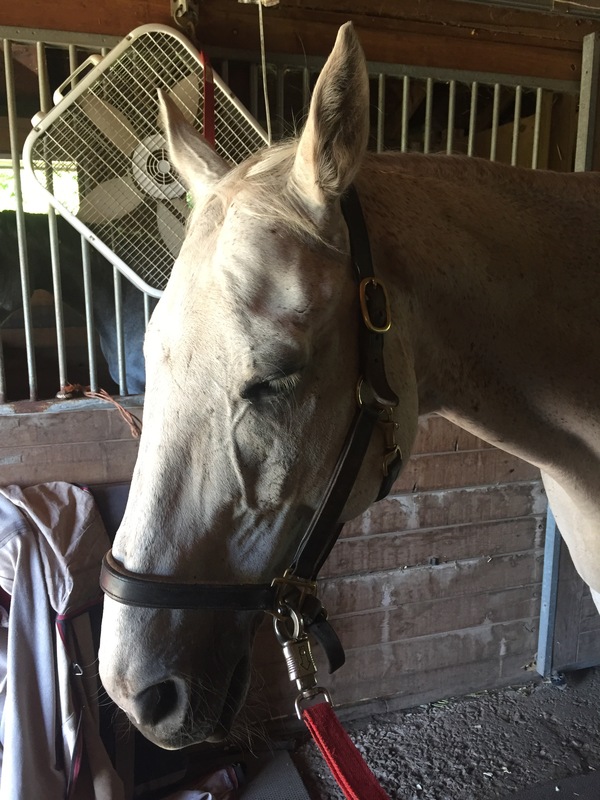 She will (hopefully) get a better ride on the weekends because her horse will be more fit and more mentally engaged and I will get to ride without having to worry about cost or commitment! Did I mention I am riding again? Can you tell I am happy? I may be able to live without riding but I am much happier with it in my life! !